Medicare’s basic eligibility criteria have remained much the same for decades, while the program has evolved considerably in other respects. Recently, however, proposals to change Medicare eligibility have moved to the forefront of the public debate. Some proposals would make incremental increases or decreases in the age of eligibility, while retaining the existing financing structure and near-universal reach amongst the eligible population. Others would allow certain people under age 65 to “buy in” to Medicare, or a similar program, upon payment of a premium that covered much or all of the cost of the benefits. Still others would create a Medicare-like program (sometimes called “Medicare for All”) that would cover the entire population and be fully tax-financed. Although any of these proposals could be made to work, most of them have not been fully specified, and all raise significant technical and program design issues. 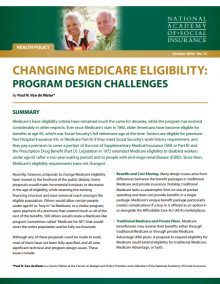 This brief aims to identify the major design challenges involved in changing Medicare eligibility and outline alternative strategies and considerations involved in navigating each. Support for this research was provided by the Commonwealth Fund.